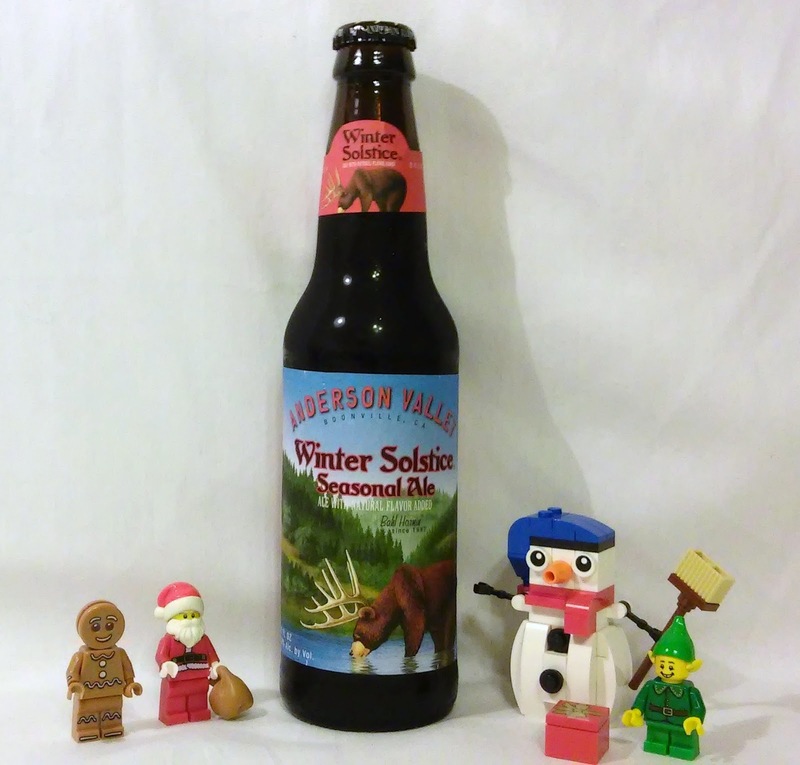 Jared Unzipped: Yule Grog 2015 Part 3: Anderson Valley Winter Solstice Seasonal Ale. 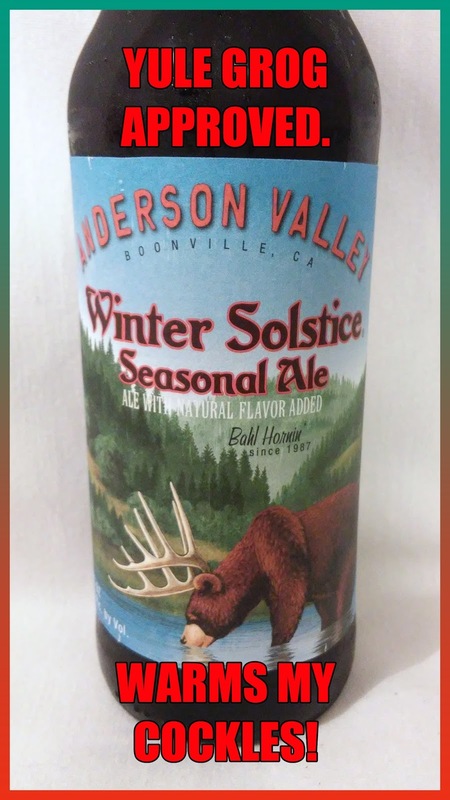 Yule Grog 2015 Part 3: Anderson Valley Winter Solstice Seasonal Ale. After two straight weeks of terrible beers, let's hope the third time is the charm! My next reviewed beer of the 2015 Yule Grog is the Anderson Valley Winter Solstice Seasonal Ale. Based in Boonville, California, Anderson Valley Brewing has been in operation since December 26, 1987. At the time, they were one of only twenty known craft breweries in the United States. They've expanded from a meager ten barrel brew house to a state of the art three-story Bavarian style brewery. Over the years, they've been awarded time and time again for various beers, ranging from their Boont Amber Ale to their Fall Hornin' Pumpkin Ale (which I reviewed as well). With each Yule Grog review, I'll be taking notes actively as I drink the beer for the first time. The notes I write will be divided into two sections -- drinking it cold and at room temperature. My comments will be genuine and on the spot. I'll highlight what I like and dislike about the beer. Whether I end up liking the beer or not, it'll be a 100% honest to goodness review. Winter Solstice Seasonal Ale is ready for consumption every year between September and January. It is 6.9% Alc. by volume and available nationwide through most major specialty adult beverage retailers. Possesses a beautiful honey color. Has a thin head with a light amount of carbonation. The aroma is only faintly sweet and hard to detect. Not overly sweet upon taking my first swallow. First gulp highlighted with hints of caramel and nuts. Only the slightest amount of bitterness, but not so much that it is unpleasant. Not particularly spicy, unable to detect any certain spices used. Clearly a case of the sum being greater than the individual parts. Very easy and pleasant to drink. Has a toffee flavor I couldn't detect when colder. The small amount of bitterness has disappeared. The creaminess really is quite delightful. Light in flavor, but hearty in stature. Overall, the change in temperature hasn't really altered the beer's flavor profile dramatically. I was quite happy with the Winter Solstice Seasonal Ale. It wasn't complex, but that's not necessarily a bad thing. In fact, I believe the smooth, simple nature of the Winter Solstice Seasonal Ale is what makes it so damn tasty and drinkable. I could have easily downed two or three more of these... though I'm not sure how well I'd be able to write this review if that were the case! Rest assured, the Winter Solstice Seasonal Ale from Anderson Valley is a mighty fine beverage that you should absolutely purchase.